Anybody and everybody is welcome to come and take part in any Buckyball Racing Club event. Full details of each race will be posted as a thread in the official Frontier Forums, normally in the Community Events section. The front page of this site will include a direct link to the thread for each race. This page gives a walkthrough of the key things to be aware of for any race, as well as answers to some of the other obvious questions, and example screenshots for race evidence. A few educational videos can also be found on the Videos page of this site. 1. Read the race rules thoroughly. While the basics of each race are very similar, most have their own particular quirks. Fully understanding the requirements is essential to be able to pick a suitable ship and ensure you capture all the required evidence. Most races are open to any ship type. Occasionally races will require docking at outposts, in which case large ships cannot be used; this will be highlighted in the race rules, and marked by an outpost icon on the race banner. Choose your outfitting to whatever you think will work best; note that some races (or some classes of entry for a given race) have restrictions on outfitting choices. 3. Sign up in the race thread. This is optional, but it's always friendly to let the organiser know you are coming, and let other racers know to look out for you on the course (and hopefully give you some encouragement if they see you!). 4. Work out how you will capture evidence. Most Buckyball Racing Club races are not live, you can make your run at any point during the race period, and are encouraged to have multiple attempts. As the race is not live, you will need to capture your own evidence to submit to the race organiser. Choose whether you will be doing so by capturing a video recording, or screenshots (or both, for safety!). Almost all races start docked at a starport, the race time begins when you launch. To get the best time, this means you should be back on the surface (not in the hangar); the start time is the last point that the station clock is visible, before you hit "Launch". 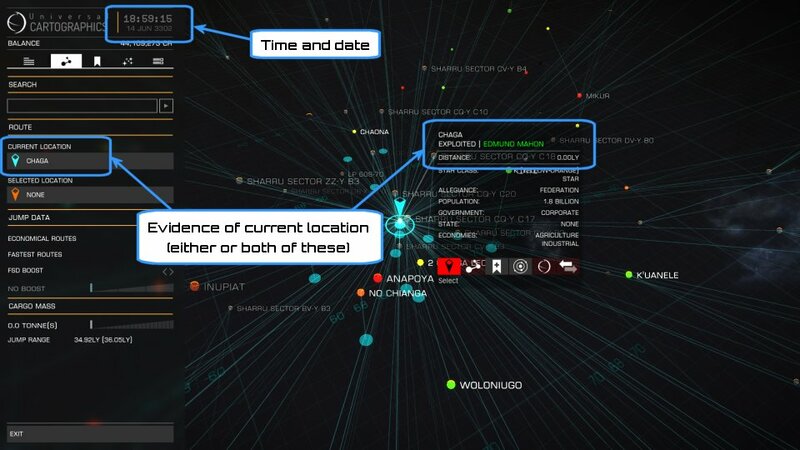 If participating in a live event, make sure that "Report Crimes Against Me" is switched OFF (in the Functions tab of the right hand cockpit panel). If recording video as evidence, check that your video recording has started before hitting "Launch". Screenshots should be easy to take; check you know how to do so from your platform. 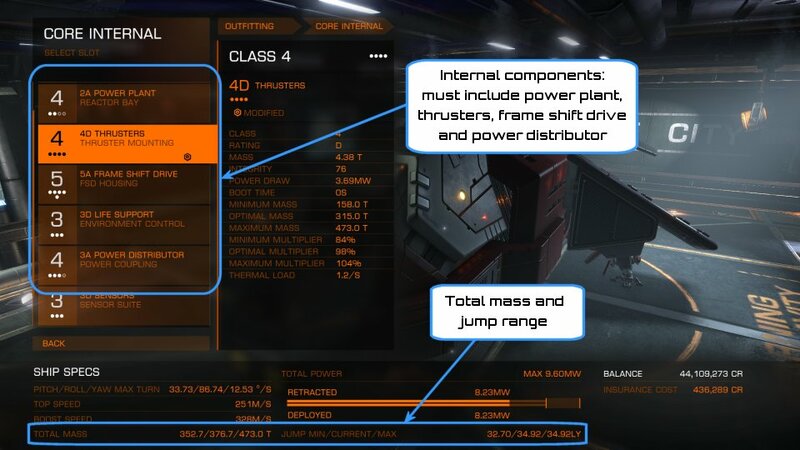 On PC, the default keybinding for a screenshot is F10, and the resulting images are saved to "Pictures\Frontier Developments\Elite Dangerous". 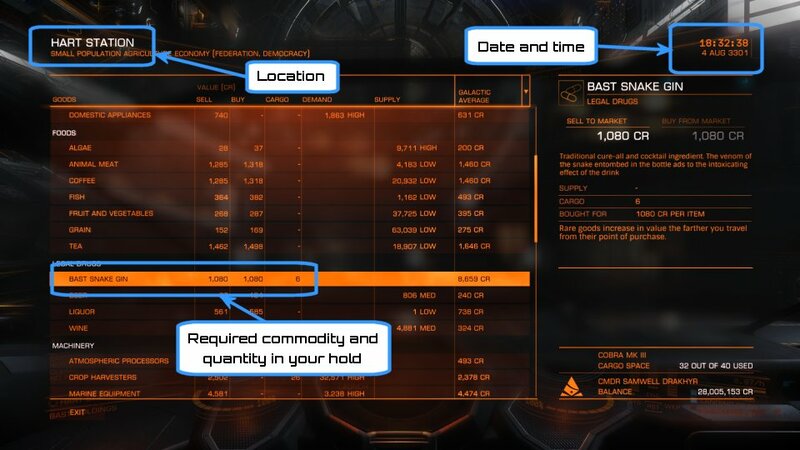 Example screenshots can be found at the bottom of this page, covering all the standard types (outfitting, launch, waypoint/end at station, waypoint/end in system without station, waypoint/end at tourist beacon or similar nav point) and showing the key elements that need to be captured in each. 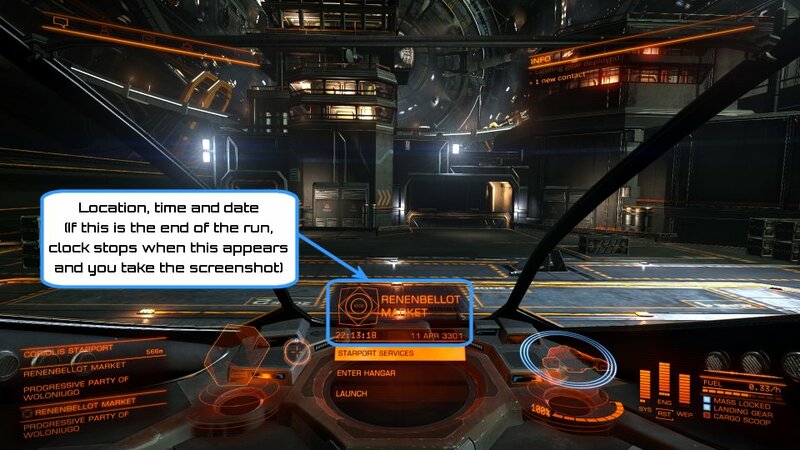 Elite Dangerous screenshots are saved as bitmap (.bmp) files, which are quite large. If uploading or emailing screenshots, it is recommended to convert them to a much smaller file type (normally .jpg or .png), which can be done with any image editor (there are also tools, such as IrfanView, which allow a batch of files to be converted in one go). Almost all races finish when docking at a starport. 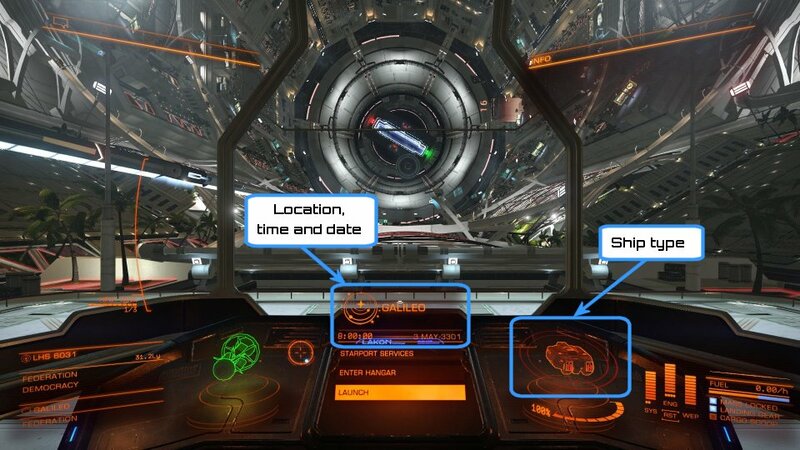 The finish time is as soon as the station clock appears on your HUD after touching down (see example screenshot below). Videos: Please do not send videos as attachments, instead upload the video to a hosting website (normally YouTube) and send a link. Screenshots: It is recommended that screenshots are uploaded to a suitable image hosting website (such as Imgur), and a link provided in the race submission. If submitting your time by email, the screenshots can be attached, but if so please make sure that the images have been converted to a smaller file type (.jpg or .png) rather than sending the raw .bmp files. Can I run the race in Solo or a Private Group? Check the rules for the individual race; some organisers specify Open Play only, most are happy with Solo or Private Group entries. However, we would always encourage racers to compete in Open Play; encountering problems with other players along the way is extremely rare (I don't think it's happened yet), and there is a lot of pleasure to be had from encounters with other racers on the course. I play on Xbox One / PlayStation 4. Can I take part? Yes, absolutely! Check you know how to capture and upload your evidence (video or screenshots) and then go ahead. Do I need to have Horizons to take part? We try to ensure that a significant proportion (currently at least half) of our events do not require the Horizons expansion. 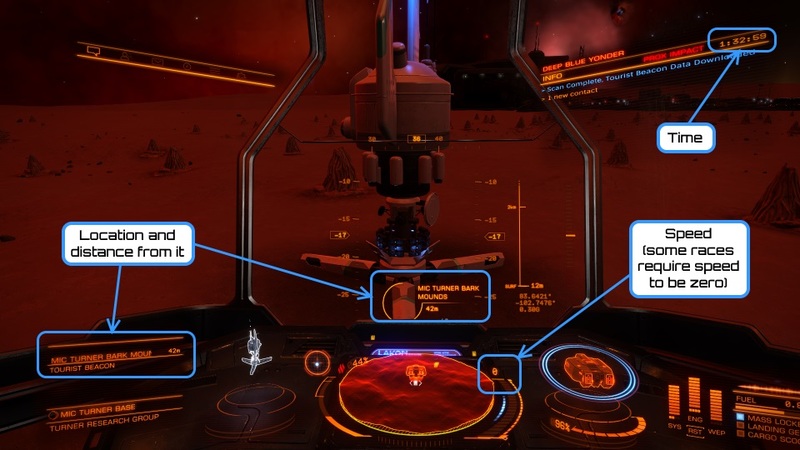 Events which require Horizons will be marked with a "planetary landing" icon on the race banner. For those which do not require Horizons, players without Horizons may feel disadvantaged by not having access to engineer modifications; most races include a "regulation" class for a specific ship build, which is always without any engineer modification, providing a level playing field for all participants. For the best time, first return to the surface of the station. Then take your starting screenshot on the launch pad just before hitting "Launch".